Here's a post on the last dinner that my BFF and I had before leaving Georgia the next day. 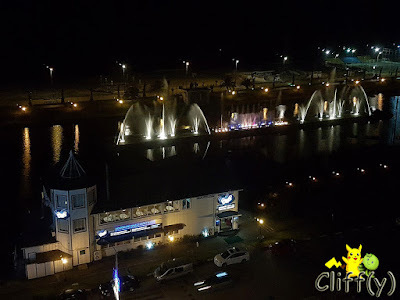 Strategically located in the vicinity of the beautiful Ardagani Lake in Batumi, Grand Grill Restaurant provides an unparalleled view of the lake all day long, as well as the Black Sea during the day. 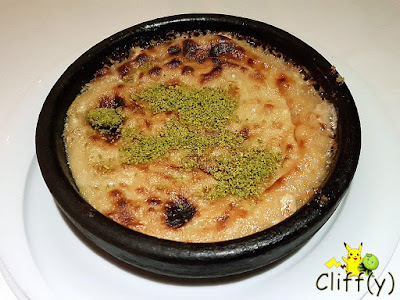 We noticed that the restaurant serves Turkish cuisine as well. In fact, our order was printed on the bill in Turkish language. 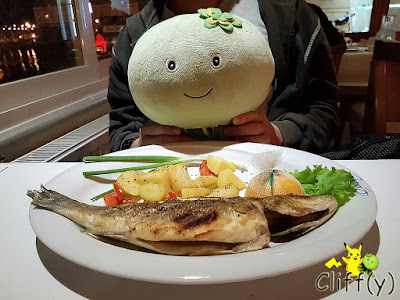 Pika's advice: If you come with three or more people, you may want to consider the restaurant's special One Meter Kebab, which is priced at GEL 88.00 (~S$46.85). We'd wanted to order a particular appetiser dish from the menu, but it wasn't available. The waitress, with minimal English communication skill, then brought a tray of the available starters for us to see. 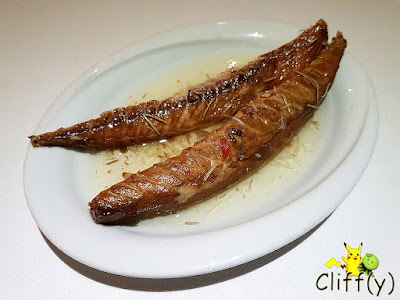 We chose the smoked mackerel with olive oil that turned out to delicious, having a heady smoky aroma. When the dish arrived on the table, we were wondering where was the curry sauce or whether we got the correct dish at all. We then found out that it was indeed a dry curry dish. The chicken breast was pretty tender, although the curry taste could be more powerful. 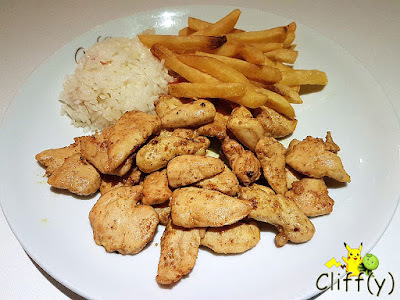 The rice was flavourful, while the fries could be crispier. 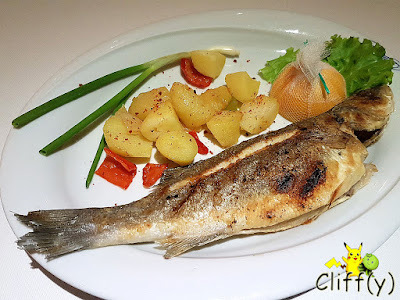 It was disappointing to know that some of the grilled main courses weren't available, so we settled for sea bass. The fish, having firm and naturally sweet flesh, was executed well. It was mildly seasoned, and the same went for the accompanying potatoes. The lemon provided had an adequate amount of juice. We regretted ordering the baked confection made of sesame paste that was topped with pistachio crumbs, even though it emitted a nice aroma. It took us a spoonful each to abandon the dessert entirely, for it was prohibitively sweet. My throat felt a tad painful afterwards. The dinner experience was marred by the terrible dessert, but the rest of the dishes was certainly not bad at all. The following photo of the restaurant and the lake was taken from our room at Sky Tower Hotel.